Although cremation dates back 26,000 years, cremation has become more and more common in recent times. Some people view cremation as a simpler, more natural funeral process, while others prefer the lower cost of cremation to traditional burial. Personalization and a variety of container (urn) sizes and styles are available for cremation. Whether you choose burial and a "touchstone" for the garden, a cemetery memorial, mausoleum vault with a plaque, or decide on a scattering under a newly planted tree, you and your family will have the opportunity to memorialize your loved one and keep him or her close to you for years to come. The Frank Duca Funeral Home is now offering Onsite Cremations at our new East Hills Chapel in Geistown. A new modern facility designed by our family after 70 years of service to the community. From your initial phone call to us, your Loved One remains in our care and never leaves our facility. 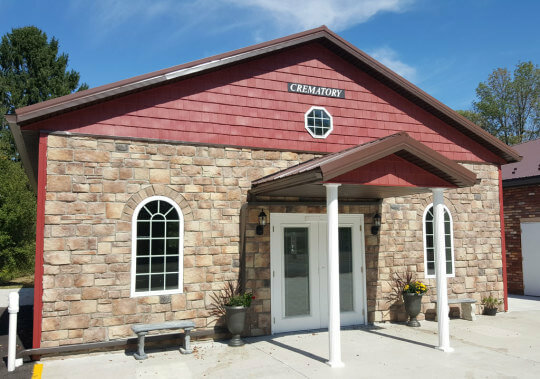 We operate our own Onsite Crematory, meaning the Crematory is located within our funeral home facility at our cremation center and each service is handled privately. We offer scattering of cremated remains by air or sea. This includes professional services of Funeral Director and Staff; transfer of deceased from place of death within 30 miles; embalming, dressing, casketing, cosmetology, rental casket, use of facilities for day of viewing; cross/crucifix, general service vehicle, memorial cards or folders, register book, acknowledgement cards, use of facilities day of funeral services, directing of funeral services, filing of all necessary paperwork, temporary container, and personal delivery of cremated remains within 30 miles of Johnstown. Does not include an Urn. This includes professional services of Funeral Director and Staff, transfer of deceased from place of death within 30 miles﻿, filing of all necessary paperwork, temporary container, general service vehicle, and personal delivery of cremated remains within 30 miles of Johnstown. Price includes a Wood Urn.